Many executives and service owners are already familiar with the power of Performance Analytics in ServiceNow. Performance Analytics helps them understand service performance quickly and make critical decisions about their IT investments, operational goals and other service objectives. A mature service management solution doesn’t limit these valuable insights to managers. You can provide your practitioners with trend information across a variety of dimensions from within the tool they use to deliver services to their customers daily. With In-Form or ‘Context Sensitive’ Analytics you can extend the power of Performance Analytics to ensure operations and service delivery teams have visibility into current objectives and goals, as well as real-time performance information to inform their customers, set expectations and improve satisfaction. ServiceNow’s Performance Analytics gives many service owners and executives powerful insights into the health of their services, their IT investments and also gives leading indicators to help them make decisions, set objectives, define goals and track progress towards them. We can do this with Scorecards that provide us with key trend and real-time information about important metrics, and dashboards to present multiple measures for a single process, team, organization or service. A great example of how ServiceNow can aggregate important metrics is the Process Workbench widget – which brings multiple scorecards together for one process with interactive breakdown filtering and contextualizing in a single place. Expected time to resolve an incident for a given category, or assignment group – based on the last 7 days of resolution times. Current backlog and trend for a given assignment group. Critical incident trends by configuration item or business service. Change trends by configuration item or business service and historic impact of changes. Average fulfillment time for a given service catalog item. CSAT scores for the current customer. 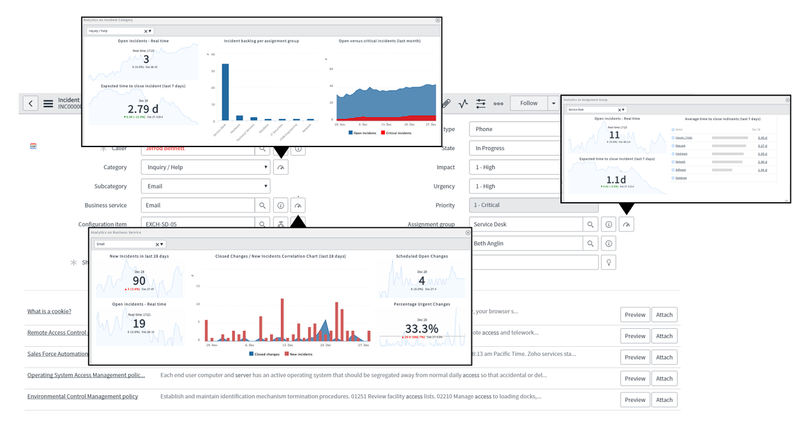 In-Form Analytics presents mini-dashboards from the form itself – the example below demonstrates in-form analytics capabilities for an incident record. You can apply these analytics dashboards in-form against almost any critical field, along with the widgets each dashboard displays. You can also provide target information on these dashboards, providing even more context to the service provider about the service owner’s or organization’s goals and objectives, allowing them to adapt their response and focus their attention more precisely. 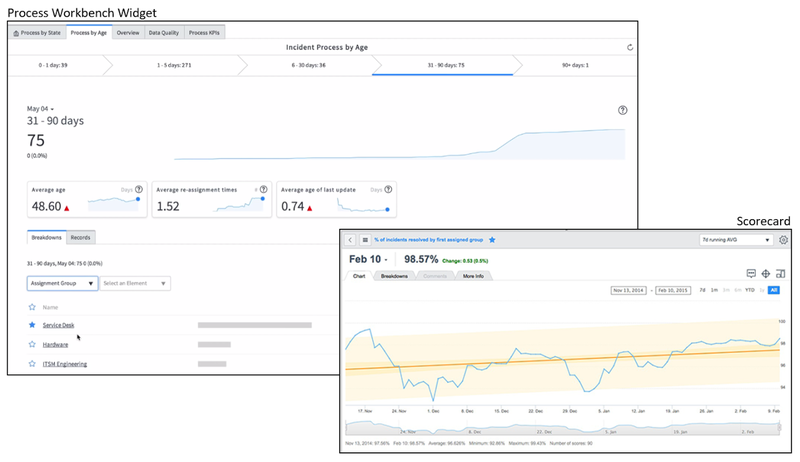 It is important to recognize that the value of the trend and real-time analytics that we have at our fingertips in ServiceNow doesn’t stop at the manager. Enabling our service providers with the same information, contextualized for the work they’re doing right now is extremely powerful in helping service owners meet their objectives, service providers work more efficiently, and can improve customer satisfaction. When you’re assessing the health of your services by setting targets and objectives using Performance Analytics, think about the information you’re using to make decisions and how much of that would be helpful at a tactical level – then use In-Form analytics to provide it to your teams.